T.U.R.F. is the musical project of childhood friends Lorenzo and Tom. They first met at a rave in 2003, where they found out they not only shared the same taste in music, but that they were also actively producing music themselves. However, in the years to follow a potential collaboration didn’t even cross their minds. 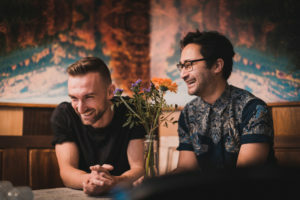 Tom began to focus more on playing live instruments, whereas Lorenzo dove into the depths of electronic music and released records under his alias Kurizu. In 2017 they finally decided to join forces to start a new project: T.U.R.F. Under this moniker they express their longtime love of house music in many shapes and forms, ranging from the grooving house from Chicago, to the deep vibes from Detroit, to the filtered disco sounds from Paris. After their jazzy debut EP on Apparel Music they continued their musical journey at Exploited Records, where they’ve released a number of highly diverse and widely supported EPs. As DJs, the pair throw down a wide variety of dance music from the archive they built digging for more than fifteen years. Keep an ear out for these two!